Scientists who study the brain have discovered that all habits reside in a special group of brain nuclei known as the basal ganglia. It is here that we can begin to examine how habits are formed in the brain. What makes this news so interesting is that so many of us believe that we can create new habits and drop old ones simply by tapping into a little bit of will power and motivation. However, this could not be further from the truth. In fact, creating a new habit or eliminating a bad one involves much more than just the decision to do so. Habits are literally rooted in the brain requiring a significant amount of focus, repetitive effort, and reward in order to make any kind of lasting changes. How habits are formed in the brain has very little to do with motivation or willpower. Just think about how many times you have tried to develop a new habit, such as a regular exercise routine to only be let down. Or better yet, how many times have you become frustrated at your lack of willpower in establishing a new habit. If you’ve ever tried to overcome a bad habit– such as smoking tobacco or even biting your fingernails, then you know that regardless of how sincere you are in wanting to overcome bad habits, erasing them is a lot easier said than done. 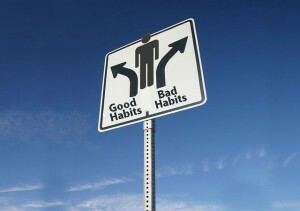 In order to successfully rewire the brain to create a new habit we must begin with understanding how habits are formed. Essentially, there are three important elements that are needed. First, there must be a cue or a trigger that is then followed by an action or routine and lastly some sort of a reward. Habits do not begin or end here, however. The brain must literally be trained to anticipate the reward once a cue is recognized in order for a new habit to be formed. Therefore, how habits are formed is much more about repetition and pattern sequences than it is about will or motivation. To understand how this habit loop works, consider an example of a cigarette smoker who craves a cigarette after a hearty meal. The full sensation after a meal may be the cue, puffing a lit cigarette is then the routine and the reward might be the sense of satisfaction experienced after the cigarette has been smoked. It is only when the brain begins to anticipate the reward (relaxation) and then the moment it recognizes the cue (full stomach) that a habit is formed. In this example you can see exactly how habits are formed, the smoker’s brain has created a powerful craving that is triggered by certain events and this craving will not go away until it is satisfied. Using triggers to precede an action you’d like to turn into a habit is just part of the process of how habits are formed. Remember that a reward is needed in order for the brain to begin craving an activity after recognizing its cue. In short, a cue, an activity and a reward must be bundled together in order for the brain to be altered into forming a habit. Also known as the basal nuclei, the basal ganglia are the brain’s control centers for routine actions that we perform without much thought at all, such as eye movements. With the knowledge that these nuclei can be programmed to accommodate new controls, scientists are looking forward to this information being useful in changing lives especially when it comes to understanding how habits are formed in the brain. In his book, The Power of Habit: Why We Do What We Do In Life, journalist Charles Duhigg outlines how scientists came to discover the habit “loop” and relays real life examples of people who have used this loop to improve the quality of their lives. The most important thing to remember about how habits are formed is that they require time and effort. Even if you want something to happen that does not necessarily mean that your will power alone can make it do so. In order to rewire your brain it requires repetition over time that involves the key elements of a trigger, action, and reward. So the next time you feel bad about that late night piece of cake or missing your workout don’t forget its not will power that must change, but a set pattern in the brain.